XSL Speed Reporter continues its wrap up of the 2009 season with the NASCAR Nationwide Series. There are not many naughty moments in the 2009 NASCAR Nationwide Series. However, I have highlighted concerns for some alarming trends which, not new to the Sprint Cup feeder series, has altered the complexion of the series into a Cup Lite tour. Nice: Kyle Busch takes his first NASCAR Championship- Being a prolific driver in the victory lane of NASCAR's major divisions, Kyle Busch has at last captured a championship crown. Winning the 2009 NASCAR Nationwide Series Championship, Busch outpaced the field for 9 victories and 30 top-10 finishes in 35 races. Second place Carl Edwards and the rest of the full-time Nationwide contenders had little chance of catching the #18 Joe Gibbs Racing Toyota. Continuing to throw his usual post race temper tantrums when race results would not work in his favour, some fans may question whether he has matured to a championship attitude. However, that same argument could have also been made towards Tony Stewart when he won the 2002 Winston Cup championship. Nice: Mike Bliss dances in the rain at Charlotte race- Within one month of Brad Keselowski bringing a James Finch-owned Chevrolet to victory at the Talladega Sprint Cup race, Finch's Phoenix Racing captured the 300 mile race at Lowes Motor Speedway (now renamed back to Charlotte Motor Speedway) on the NASCAR Nationwide series. During what would be the final pit stop cycle in the race, many of the leaders have entered pit road for service, relinquishing their position on the track. It was also this time when a rain shower was expected to fall on the speedway. Mike Bliss as well as Brendan Gaughan, wheeling a Rusty Wallace-owned Chevrolet, chanced the weather would affect the race as their fuel tanks ran to vapour. The plan was well-played as caution soon slowed the field. By lap 170, the race was called as Bliss' and Gaughan's Chevrolets took the top 2 positions. Being Bliss' first victory in almost 5 years, it was the first win for Finch's Phoenix Racing team since 2003 when the team was in an alliance with Chip Ganassi fielding Jamie McMurray part time. Though Mike Bliss and the Phoenix Racing organization celebrated in the rain a Charlotte Motor Speedway, the pairing deteriorated heading into Waltkins Glen. With Bliss attempting to preserve his top five place in the Nationwide Series points, the driver jumped into several rides to finish off the year eventually returning to Phoenix Racing for the final race at Homestead. Mike Bliss finished 16th in the race but most important reclaimed a 5th place in NASCAR Nationwide Series points. Naughty: Field-filling entries- Field Fillers, Start and Park, the terminology of the tactic may be unsettled but the practice refers to cars which are focused in a time when NASCAR races are comprised of fewer full-time cars than the 43 starting position. Field Filler cars and teams focus on the shorter entry lists, qualify their cars for the intention to run just a few laps of the race before parking the vehicle, collecting last place money. These teams are not even equipped to run the full distance of a Nationwide series event, consisting of only a few volunteer crew members. The lack of a salaried staff and other race equipment allows the team owner to make money. While this tactic has been argued as a way for these teams to gain resources, this development has yet to be proven in any form of NASCAR. Nice: Brad Keselowski and JR Motorsports- Only two seasons prior to 2009, Brad Keselowski was sitting on the sidelines as sponsorship for his family-owned NASCAR truck team dried-up leaving him a free agent driver without a major NASCAR win to add glimmer to his racing resume. In 2007, Keselowski's fortunes changed when he subbed for a suspended Ted Musgrave in a NASCAR Craftsmen Truck Series race. A front-runner for much of that event, the drive of Keselowski attracted the attention of Dale Earnhardt Jr who had spent two seasons playing musical chairs with several drivers in the #88 JR Motorsports Chevrolet. The Matching paid off in 2008 as Brad Keselowski took the #88 JR Motorsports vehicle to victory for the summer race at Nashville Superspeedway. 2009 started badly for Keselowski and the JR Motorsports team when a series of poor results. In fact, it took 6 races before the team's first top 10 of the year. Some observers questioning whether Keselowski has a lasting future in NASCAR. However, Brad Keselowski's surprise victory at the Sprint Cup in Talladega appeared to have a spin-off effect for his full-time Nationwide series program. In the late May race at Dover winning the event through a daring pass on Logano and Kyle Busch in the final run to the checkered flag. Keselowski and JR Motorsports together won three more races in the 2009 NASCAR Nationwide Series which also allowed the driver to elevate himself to a 3rd place position in the final year-long standings. We know already that Brad Keselowski stint at JR Motorsports has ended with 25 year old driver taking a exciting new opportunity in the Sprint Cup series for Penske Racing. Kelly Bires becomes the new wheelman for the #88 Chevrolet into 2010. Naughty: Keselowski causes calamity in final races of 2009- Brad Keselowski dished out as much more than he had received in through the 2009 NASCAR Nationwide series. In the round at Memphis Motorsport Park, Keselowski aggression was showcased as he fought against Kyle Busch, Mike Bliss and Carl Edwards in heated combat. The final three cautions of that race involved the #88 Chevrolet which went on the victory. Part of Brad Keselowski's aggressive driving on that day could also be attributed to his eligibility for a $50,000 award Dash 4 Cash challenge which he clinched be the Memphis win. Despite coming on the wrong side of some rough and tumble driving, Keselowski's competitors respected the actions of the victor as classic short track racing. The Able Body Labor 200 at Phoenix International Raceway was an exception, at least in the mind of Denny Hamlin. On lap 157, Brad Keselowski and the race's pole sitter Denny Hamlin were involved in a high-speed turf war which started when Hamlin nosed his Toyota into the rear of Keselowski's Chevy. The rough driving escalated when Keselowski struck back, spinning out the #20 Toyota. Naughty and Nice: Hamlin settles score with Keselowski at Homestead- Immediately after getting wrecked by Brad Keselowski at Pheonix, Denny Hamlin provided a memorable late year sound bite on the ESPN coverage of the Able Body Labor 200 pledging revenge against the Godaddy.com-sponsored #88 JR Motorsports Chevrolet in the final race at Homestead-Miami Speedway. "There's a lot of guys that have a lot of chips that they're going to cash in, I'm just going to be the first to the pay window." At the Ford 300 on the Homestead-Miami Speedway oval, Hamlin followed up on his threat, spinning the #88 JR Motorsport after just 34 laps. Clearly reminding Keselowski, NASCAR officials were also prompted by the incident. NASCAR Nationwide officials penalized the Hamlin-driven Toyota a lap but the driver was able to recover to 5th place at the end of the event. After the race, as Brad Keselowski was confronted with a choice to retaliate, Keselowski simply stated "I don't hold any grudges, and I'm ready to move on,"
Nice: One more rain dance in Montreal- Depending who you talk to, the opinions for racing stock cars on road races span from accepting it as an unique NASCAR experience or an abomination to pure stock car auto racing. With oval racing purests having their way between the 2002-2004 seasons, the NASCAR Nationwide Series has been putting on some outstandingly original shows on the road courses. The 2009 NAPA Auto Parts 200 had the pedigree of a wild 2008 race which involved the first NASCAR race ever raced in the rain. This year's race would stack up as a collision-ridden continuance amidst another wet run on Circuit Gilles Villeneuve. With competitors sharing more competitive combat than a Toronto Maple Leaf versus the Ottawa Senators hockey game, the track provided the best example of the classic NASCAR idiom 'rubbing is racing'. At the end Marcus Ambrose, a driver who has been in prime shape to win the previous two Montreal events, looked poised to finally capture a deserved victory. However a rare mistake, involving Ambrose awkwardly jumping a curb, caused the race leading Toyota to lose significant speed in the final two turns allowing the Ford of Carl Edwards to thunder by for the checkered flag. 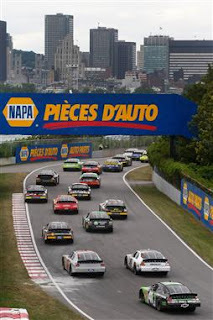 Naughty: Scheduling the NAPA Auto Parts 200 in Montreal on the same weekend as the Grand Prix of Mosport- Leaving Canadian auto racing fans in a real dilemma, the exciting new NASCAR Nationwide Series race on Circuit Gilles Villeneuve was placed on the same weekend as one of the oldest running sports car races in the country. Brace yourself this year, 2010 schedules will again cause a conflict in the late August plans for Canadian motorsport enthuiasts. Nice: Kevin Harvick Inc team places their owner in victory lane- Winning the 2001 championship when the Nationwide series was known as the Busch Series, Kevin Harvick's success in the tour was earned winning the cars of his Sprint Cup series car owner Richard Childress. Following the 2007 season, Harvick made a personal decision to commit to running only a Kevin Harvick Incorporated Chevrolet. Having gone winless in 2008 driving the selected NASCAR Nationwide series schedule, Kevin Harvick was finally able to claim victory in his own car by winning at Bristol on March 21st. Harvick would also win later in the season at Atlanta with his team. Naughty: The regular impact of NASCAR Sprint Cup series drivers and teams in the Nationwide series- Though Cup regulars double-dipping in the lower series of NASCAR have been a common occurrence even during the infancy of the sanctioning body, the past decade has involved far more incursions by the Sprint Cup series drivers. With the start of the 2009 season at the Camping World 300 race on the Daytona International Speedway, 9 of the top-10 drivers were NASCAR Sprint Cup regulars. As 2009 ended, Mike Bliss and Brad Keselowski (who drove most of the Sprint Cup schedule) counted for a collective 5 wins at Nationwide Series regulars not running the full Cup calendar. Besides the hunger by drivers like Kyle Busch and Carl Edwards to race more than once a week, the main reason for Cup drivers' presence in the series is related to sponsor money. With companies striding to make every advertisement dollar count, they want top value and the prestige of being behind a winning name, not a rookie and development driver's name. Cup teams operating Nationwide teams have been growing more dominate with every win in 2009 coming for a team with Cup affiliation. What this has done to the NASCAR Nationwide Series has consolidated the major sponsors to Nationwide series entities of Cup teams and brought down many of the hopes of independent teams during this recent era. Nice: Logano logs in for the Long Haul- While the 18 year old's NASCAR Sprint Cup series entrance in the Joe Gibbs Racing #20 Toyota was admitted by many as premature, the second season of competition of Joey Logano in the 2009 NASCAR Nationwide Series has provided some serious physical evidence to his stock car racing promise. In 2009, Joey Logano captured 5 victories all on tracks larger than 1.3 miles. Benefiting from the powerhouse organization of Toyota, Logano's true driving abilities came within in team rivalries on the track. Furious combat with teammate Kyle Busch in identically-prepared Toyota Camrys showed some of the best on-track battles of the 2009 Nationwide series.